The Polar Vortex weather system plunged temperatures across the Upper Midwest and Great Lakes regions to record lows this week, to below even Antarctican levels. On Wednesday Chicago hit a record low of -23 degrees Fahrenheit (nearly -31 degrees Celsius), with wind chills into the -50 degree range. Some 11 deaths were attributed to the extreme cold, while less serious consequences ranged from deep annoyance to immobilized cars, frozen pipes and kids home from school (see “deep annoyance”). 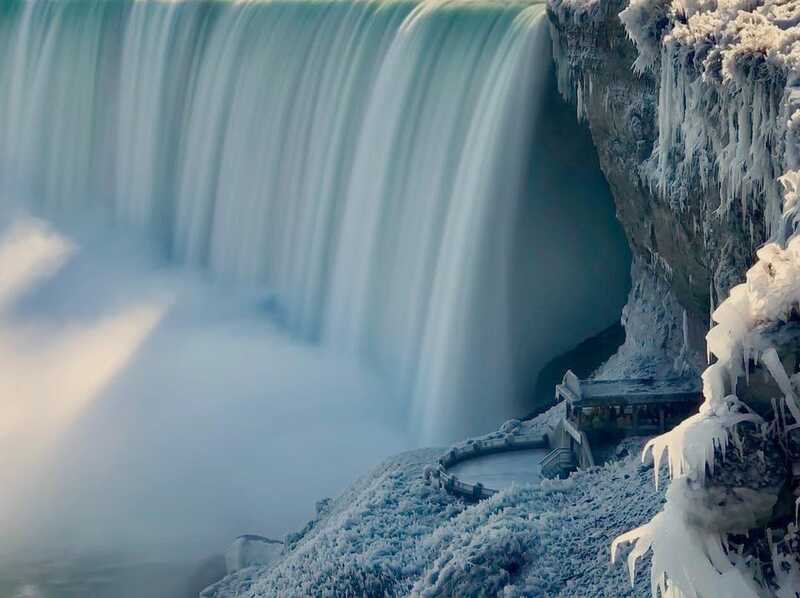 No, the falls didn’t freeze into one giant mass – that’s virtually impossible with such humongous amounts of flowing water – but it kind of looks that way. Here’s how: If you’ve been to Niagara, you probably recall tiny, even microscopic, water droplets getting airborne off the falls. 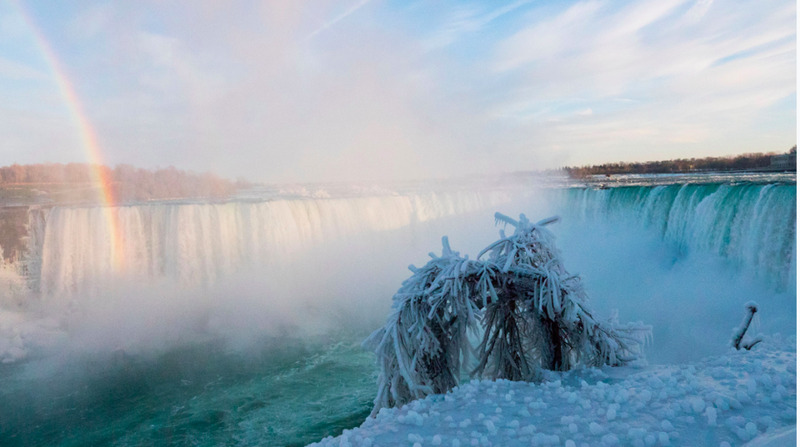 “During particularly cold temperatures, the mist and spray begin to form a crust of ice over top of the rushing water,” says David Adames, acting C.E.O. for the Niagara Parks Commission in Ontario. That crust makes it appear that the water has stopped, though it continues to flow beneath, as in these pictures from last year.. It may be called a bridge, but don’t even think about going out on it; some early visitors learned the hard way. 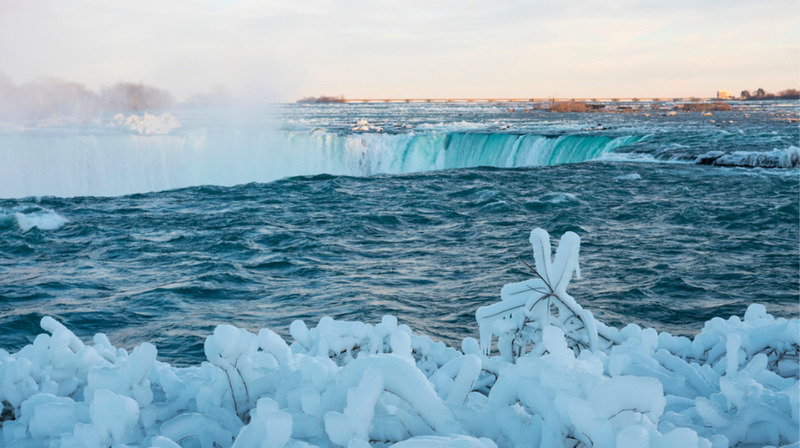 “Beginning in the 1880s, it became a popular pastime to gather on the ice for entertainment and to enjoy refreshments served out of outdoor huts set up on the frozen surface,” says a Niagara Parks press release. An “unfortunate mishap” in 1912 led to the deaths of three party people and put the kibosh on it ever since. 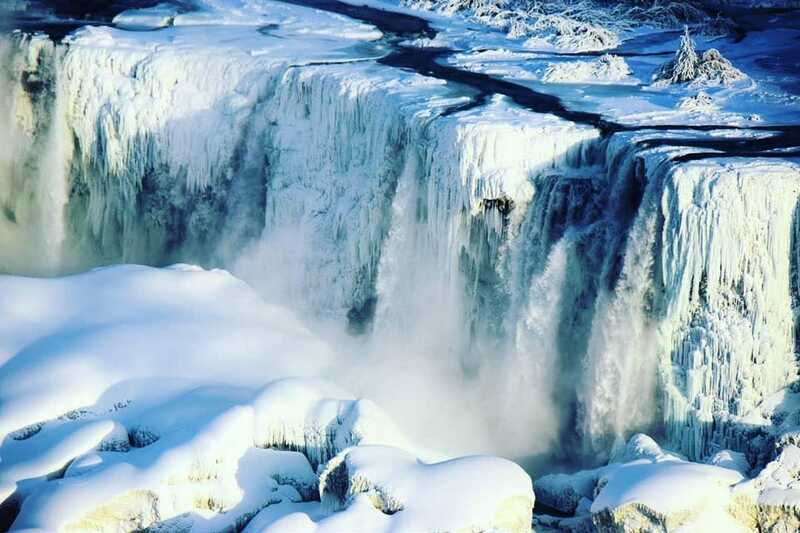 To see the frozen falls for yourself, you’d best get there soon. Temperatures are expected to rise into the low 40s Farhenheit (5 to 8 degrees Celsius) by early next week.